B,I,A.AD,WGTH, Available for background music at parties, elegant arrangements. Welcome Seniors! The Dog Who Loves to Sing and His Cool Jungle Band"
We are happy to help you find a great piano teacher. 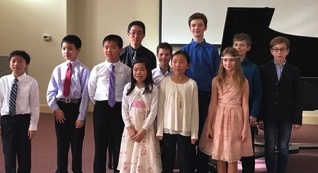 One of our professional, committed and caring piano teachers is the right fit for you. 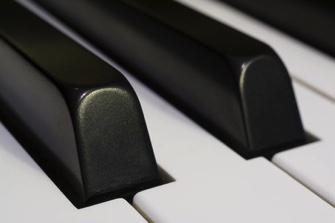 Your musical journey awaits and your new piano teacher is waiting to hear from you. Elfi Randolph (Elfriede Rosa) our beloved friend, colleague, mentor and fellow musician passed away at aged 85, on Tuesday, September 26 surrounded by her family. Elfi was born in Vienna, Austria where she spent a happy childhood and studied classical music and dance. She later graduated from the Vienna Commercial Academy and was a member of the Christian Science Church. There she met her American husband Douglas whom she married in 1956. Shortly afterwards they moved to America and settled in Hatboro, PA where they began their family and had three sons: Eric, Mark & Scott. 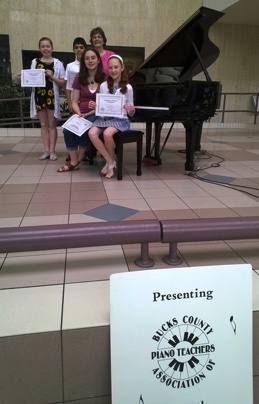 In Hatboro, she taught piano and was a Founder & Charter Member of the Bucks County Association of Piano Teachers (BCAPT). She also worked at Philadelphia National Bank, the Bank of Old York, Nationwide Insurance, and as a full charge bookkeeper for the Upper Moreland Library. 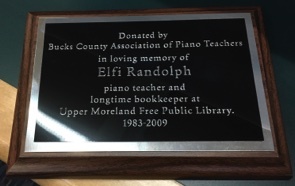 After retiring from the library at the age of 78, Elfi continued to teach piano & remained an active member in her community. Elfi also had a very busy social life. 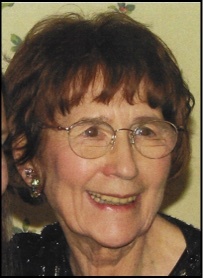 She enjoyed attending concerts and playing Canasta, her favorite card game, and belonged of to the Hatboro YMCA. She was a member of the First Church of Christ Scientist-Jenkintown as well as a member and reader for the Hatboro Christian Science Society. Elfi was a wonderful woman who loved and was loved by so many people wherever she went. She was so important to all of us in BCAPT and volunteered in so many capacities throughout the years which included being Vice-President and President. 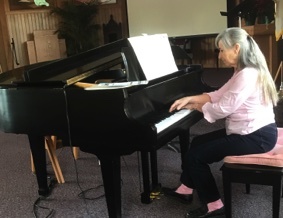 Most recently she was one of our current recital chairpersons and a board member as well as being a devoted piano teacher and loyal friend. There is no way that we could ever express how much she meant to us and how much we will miss her.